Under normal conditions, machines receive periodic inspections, and their overall condition is recorded. Such inspections usually include the drum, sheaves, and any other parts that may come into contact with the wire rope and subject it to wear. As an additional precaution, rope related working parts, particularly in the areas described below, should be reinspected prior to the installation of a new wire rope. The very first item to be checked when examining sheaves and drums, is the condition of the grooves (Figs. 35, 36 and 37). To check the size, contour and amount of wear, a groove gage is used. 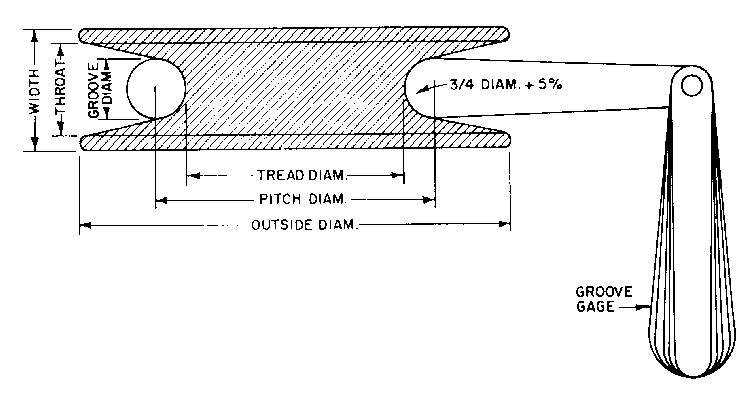 As shown in Figure 35, the gage should contact the groove for about 150º of arc. Two types of groove gages are in general use and it is important to note which of these is being used. The two differ by their respective percentage over nominal rope diameter. For new or remachined grooves, the groove gage is nominal plus the full oversize percentage. The gage carried by most wire rope representatives today is used for worn grooves and is made nominal plus _ the oversize percentage. This latter gage is intended to act as a sort of “no-go” gage. Any sheave with a groove smaller than this must be regrooved or, in all likelihood, the existing rope will be damaged. When the sheave is regrooved it should be machined to the dimensions for “recommended minimum new groove” given in Table 12. This table lists the requirements for new or remachined grooves, giving the groove gage diameter in terms of the nominal wire rope diameter plus a percentage thereof. Similarly, the size of the “no-go” gage is given, against which worn grooves are judged. Experience has clearly demonstrated that the service life of the wire rope will be materially increased by strict adherence to these standards. Figure 37. 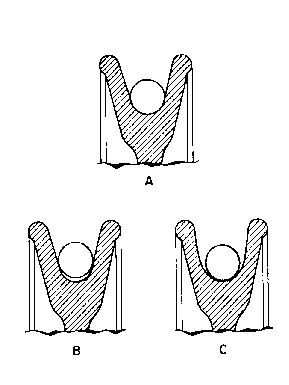 Illustrating the various dimensions of a sheave, and the use of a sheave gauge. Figure 35. 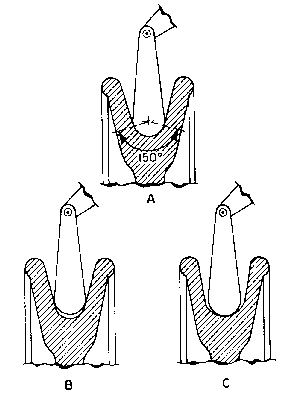 Cross-sections illustrating three sheave groove conditions. A is correct, B is too tight, and C is too loose.